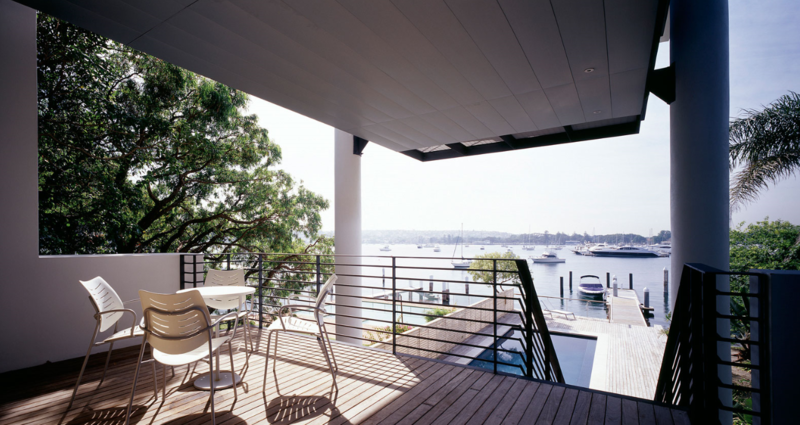 The original house, located in Point Piper, Sydney was designed by Modernist architect Hugh Burich and completed in 1961. This photo was extracted from a Vogue Living article dated March/April 2006. Scanning has sadly altered the quality of the photo but it is important, we believe, to view the house before and after. 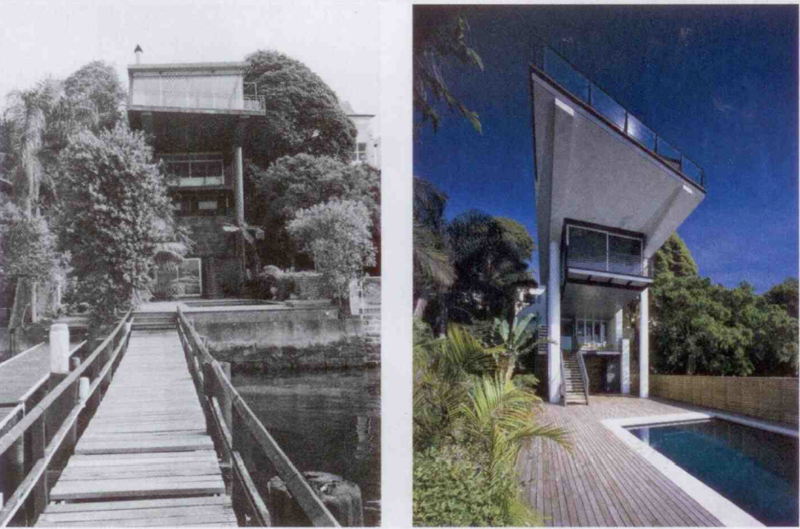 Hugh Buhrich (1911-2004) was a German-born modernist architect, who completed a series of houses in Sydney between the late 1950s and the early 1970s, of which his Castlecrag House (1968-72) is the most well-known. He was a key figure in introducing a rather eclectic modernist style to Australia. Drawing on his time working with Hans Poelzig, Buhrich developed a style that synthesized his German expressionist tendencies with his love of Mies van der Rohe and the International Style. When Louise Nettleton was first engaged on the project in 2005, the house had been vacant for 2 years, it was riddled with concrete cancer, leaked badly in several places and was very dark. The owner’s brief was to respect the existing house but update it for a more modern lifestyle for a family of four and to accommodate visiting grandparents. The overriding consideration was that any renovations should retain the integrity of Buhrich’s classic 1960’s design. Nettleton’s main objective was to maintain Buhrich’s most dramatic elements: the cantilevering living room and splayed terrace, with their slender concrete columns. The house has been significantly altered to add an entry court, a central court to allow northern light and ventilation into the internal spaces, A circulation bridge and stairs were placed adjacent to this courtyard to open up views throughout the house and a main bedroom slung under the cantilever top floor. The entry sequence from the western street frontage has also been reworked: a paved entry courtyard was cut – as a threshold – into the original footprint, with an artist’s studio to the south. The garage was moved towards the street. Nettleton’s design added to and cut space from the original to make the home more functional. Extensive repairs and the eventual replacement of the concrete structure were required to maintain the building. The planning is direct and simple, and works from Buhrich’s existing levels, apart from the addition of the bedroom, which is literally a modernist box hung from the massive cantilevered slab. This insertion, secured to the columns with steel plates, is clad with glass and zinc. The intention was not to compete with the original, but rather to emphasize the dramatic gesture of the cantilever and the columns. Not everyone was going to be happy with the design. While it won Nettleton an official commendation from the Royal Australian Institute of Architects (now AIA) and the People’s Choice prize in SMH Domain, the project was not without controversy. Concern hinged around three main decisions; to cut a three-storey courtyard into the fabric; to abandon the narrow and precipitous deck entry – a classic Buhrich device – pinned along the northern front; and to push the main bedroom out between the two great pencil columns that support the diving board. This should, however, be regarded as a successful restoration given the condition of the house and the fact that it was not heritage listed. In 2001, when bought by its present owners, the house was dilapidated and had a development approval to brick in most of the cantilever, thus maximising volume. Luckily for the house, the new owners opted for a new architect, Louise Nettleton, and a new design. Nettleton loved the house. 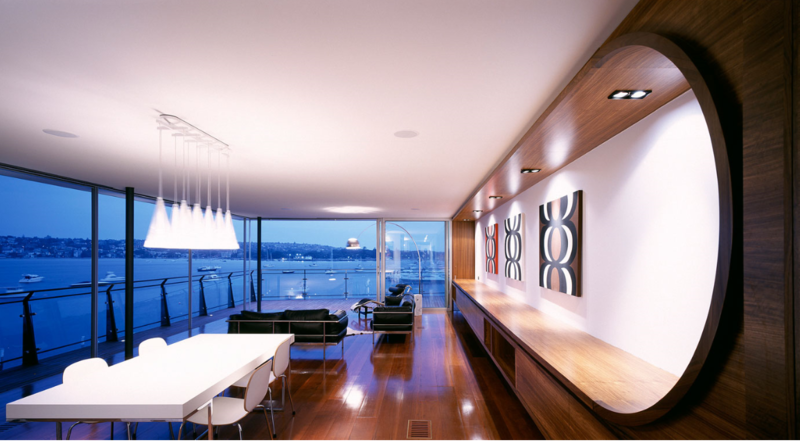 Her renovation, therefore, retained its essential design discipline – the linear plan and breathtaking cantilever. While Nettleton admits that the new arrangement reduces some of the brutalism of Buhrich’s original cantilever, she believes she has retained its drama, pressing the fact that it remains ” the beauty of Buhrich’s building and is still the hero”.